This lesson focuses on art fundamentals such us elements of art and principals of organization (composition/design). 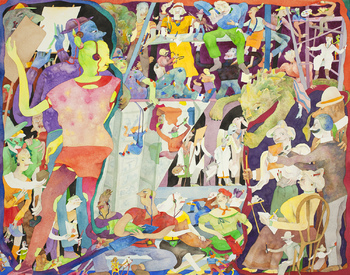 Project is inspired by crowded composition in painting by Gladys Nilsson, a member of Hairy Who. Lesson consists of list of questions to lead a class discussions, project description, essential question, enduring understanding, learning objectives, new vocabulary, visual arts standards, supporting image, examples of students' work and background information.